I’m a huge fan of animation but one sub-genre that I don’t have a lot of experience with is anime. If Metropolis is anything to go by, I have clearly been missing out on a beautiful and interesting genre of films that I really need to dive deeper into. While I wouldn’t quite call it a masterpiece, Metropolis is a very good anime film that I enjoyed a great deal. Late last month, Mill Creek Entertainment released a new steelbook edition Blu-ray of the film. While Metropolis has been released on Blu-ray before, it was as a print-on-demand BD-R release (which tend to not last as long as non-MOD Blu-ray releases). While there aren’t a ton of extras, this new edition makes for a nice upgrade for a very good film. Metropolis is a 2001 film based on a manga from the late 1940’s (which itself was partially based on the 1927 film of the same name). The film is set in the future in a city called Metropolis where humans and robots (mostly) coexist, though robots are second-class citizens relegated to the lower levels of the city. Despite the technology the city has, Duke Red (a rich businessman who effectively rules the city despite not holding an official title) has pretty much turned it into a dystopian nightmare. His ego is so great that he has funded a massive tower (the Ziggurat) as well as an advanced robot based on his deceased young daughter Tima. His son Rock (who works as an operative stoking tensions between humans and robots) finds out about Tima and tries to take her out but a boy named Kenichi saves her and befriends her. However, Duke will stop at nothing to get his “daughter” back (and Rock continues to try to kill her). Metropolis doesn’t really have a groundbreaking story or anything like that but it does almost everything else extremely well. One of the best elements of the film is its great worldbuilding. I honestly wish the film was a bit longer (even though its run time is already pretty long at 107 minutes) just so I could see even more of the city. Its a neat idea to have multiple levels to the city with the poor robots being forced to work in the lower levels. A big part of the reason why the worldbuilding is so great is due to the beautiful animation. The animation is very stylish and colorful and it really helps make the world “pop.” While the story might not be great or particularly original, the worldbuilding and animation are so good that it almost doesn’t matter. I also want to mention an area of the film that I usually don’t cover (because for most movies I review it is neither a strength or weakness). That is the lovely jazz score by Toshiyuki Honda. There is a particularly haunting scene at the end with an absolutely perfect musical arrangement. There are plenty of other great songs included and the score really helps make the film even more beautiful. I wouldn’t say Metropolis is a household name but it is a pretty well-known film. Most people reading this review probably already know about the film and only really care about what this edition adds in terms of picture quality, extras, and packaging. While the film has been released on Blu-ray before (last year actually), it was via Amazon’s manufacture on demand program so it was released as a BD-R. This is a normal Blu-ray release, which should last a lot longer than a BD-R. As I already owned the DVD version of the film, I was able to compare the video quality of both releases. I would say the upgrade is pretty significant and as an animated film, picture quality is pretty important. The video quality isn’t perfect but I would definitely say it is worth upgrading if you are a fan of the film. While I don’t own the BD-R release of Metropolis, based on the Amazon reviews it appears that it was a pretty lazy release with relatively poor video quality. I’m guessing this new Mill Creek Entertainment version is a significant upgrade over that as well. This release of Metropolis comes in nice Steelbook packaging with some pretty sweet artwork. I’m not the biggest Steelbook collector out there as I only buy them if they are around the same price as the normal release, but I do think they usually look quite nice (and of course the packaging is much sturdier). Unless you are a huge fan of this film, I wouldn’t buy this release just for the Steelbook packaging but it is a nice addition. One thing that is a little disappointing is that no new extras are included in this release of Metropolis. While it does include a Making of Metropolis featurette, filmmaker interviews, animation comparisons, and a concept art gallery, all of those extras were included on the DVD release. I do wish Mill Creek Entertainment would have added a few more extras to justify the higher price. This is one of the biggest flaws with this release. In conclusion, Metropolis isn’t a masterpiece but it is a very good anime film that I think most people would enjoy. But does it pay to upgrade to this new Steelbook edition release from Mill Creek Entertainment? While I am a bit disappointed by the lack of new extras, I think the increase in video quality and the packaging are enough for fans of the film to upgrade. If you don’t already own the film and are interested in watching it, I would also recommend this edition as your other options are a DVD or a BD-R with inferior video quality. Recommended. 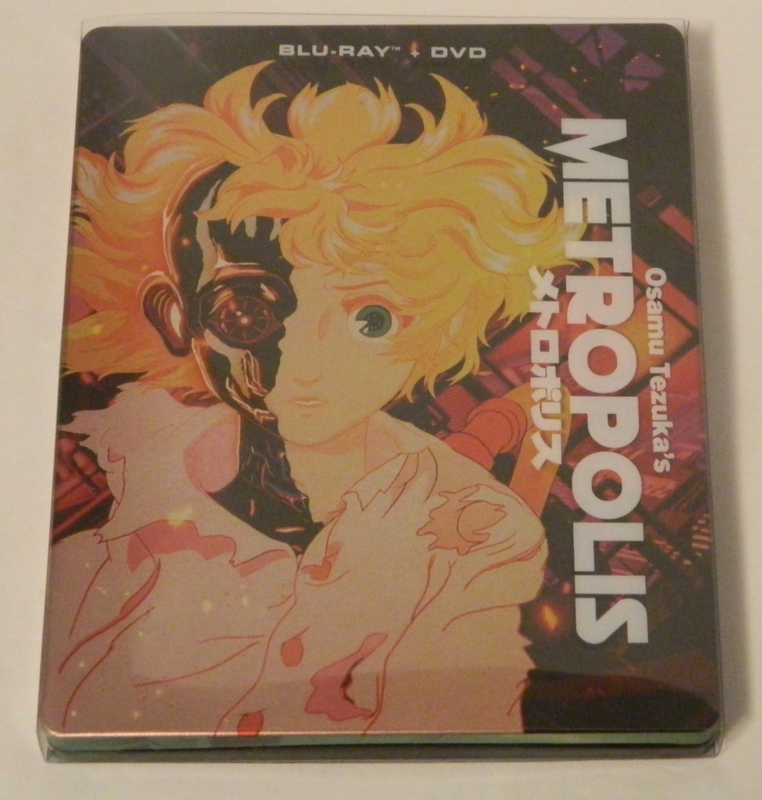 Osamu Tezuka’s Metropolis: Steelbook Edition was released on Blu-ray on October 30, 2018. We would like to thank Mill Creek Entertainment for the review copy of Osamu Tezuka’s Metropolis: Steelbook Edition used for this review. Other than receiving the review copy we at Geeky Hobbies received no other compensation. Receiving the review copy had no impact on the content of this review or the final score. Beautiful animation that really shows off the great worldbuilding the film does. The picture quality is significantly better than the DVD release of the film. The story isn't particularly original. No new extras are included (outside of the nice Steelbook packaging).